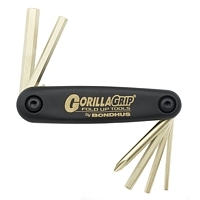 Bondhus Tools is famous for having the finest quality hand tools that work. This US Company takes pride in producing high-quality, long-lasting, timesaving tools. 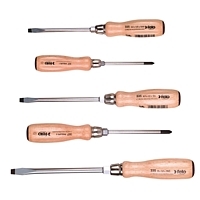 Their lineup includes screwdrivers; hex, ball and star sets; and L-wrenches with unique tips and different handle styles. Bondhus has the right tool for the job! Felo Tools has partnered with Bondhus for distribution rights in the US. They have been producing high-quality screwdrivers in Germany since 1878, and their lineup includes interchangeable screwdriver-blade systems, screwdriver sets, socket and bit sets, and specialty screwdrivers. Felo hand tools are the highest quality hand tools on the market; Felo simply doesn't produce low-end tools. These tools are designed for individuals who appreciate well-made tools and who need tools that work as designed. The tools sold through BondhusTools.com are drop-shipped directly from the factory. Because of the quality of the tools and our drop-shipment arrangement, all orders are shipped via UPS and require a signature on all packages to be delivered in Canada and the US. This required "Signature Requested" protects both the buyer and the seller. Tools displayed here on the home page are favorites among diehard Felo and Bondhus tool enthusiasts. These are quality tools and you can feel proud to have them as part of your tool collection! This amazing 32-in-1 9-piece kit comes neatly packaged in a nylon belt pouch.The handle can be used in either a standard screwdriver mode or in a T-handle position to help deliver the torque required to get the job done, whether to tighten or to unfasten. The Felo 50624 Smart Belt Pouch comes with 8 blades, each with 2 tips (Slotted, Phillips, and Torx), and one comfortable handle with two blade positions. The handle and blades are manufactured in Germany of the finest-quality materials and tested to the highest standards to maintain a lifetime of use. 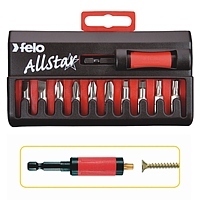 This outstanding Felo 52767 Ratchet 8-in-1 Screwdriver is a must for any toolbox. The telescopic cap makes for easy access to the 7 Phillips, Slotted, and Square bits stored under it. The magnetized bit driver holder, where the eighth bit is ready for use, has great holding power to keep a fastener tight into the bit. Bits are easy to replace into the stainless steel sleeve. The handle with its pleasant soft outer material and comfortable grip helps to deliver the highest torques. This kit is manufactured in Germany of the finest-quality materials and tested to the highest standards to maintain a lifetime of use. 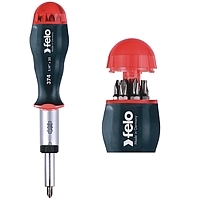 The Felo 53523 Slotted and Phillips Screwdriver 3-piece Set is the Cadillac of screwdriver sets. The kit includes 1 Phillips and 2 Slotted tips. The ergonomically designed 2-component handle has a pleasant soft-grip outer material to help deliver the highest torque. Its built-in anti-roll design prevents the tool from rolling, and it has a full-length impact-proof core. The handle and blades are manufactured in Germany of the finest-quality materials and tested to the highest standards to maintain a lifetime of use. The Felo 50707 Slotted and Phillips Screwdriver 5-piece Set is the Cadillac of screwdriver sets. The kit includes 2 Phillips and 3 Slotted tips. The ergonomically designed 2-component handle has a pleasant soft-grip outer material to help deliver the highest torque. Its built-in anti-roll design prevents the tool from rolling, and it has a full-length impact-proof core. The handle and blades are manufactured in Germany of the finest-quality materials and tested to the highest standards to maintain a lifetime of use. The 53167 Felo 6-piece Slotted and Phillips Ergonomic Screwdriver Set features the first handle that adapts to the user's hands. The kit includes 2 Phillips and 4 Slotted tips. The impact-proof handle core is coated with an elastic scratch- and acid-resistant elastomer that contains cells of highly flexible plastics for greater comfort. Its built-in anti-roll design prevents the tool from rolling. The handle and blades are manufactured in Germany of the finest-quality materials and tested to the highest standards to maintain a lifetime of use. 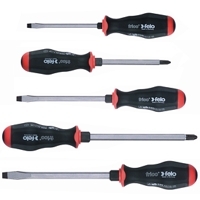 The Felo 5-piece Slotted and Phillips Screwdriver Set is the Cadillac of screwdriver sets. 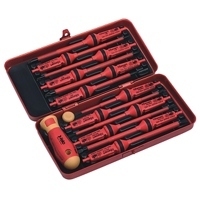 The 22155 kit includes 2 Phillips and 3 Slotted tips. The ergonomic beech wood handle has a comfortable design that helps to deliver the highest torque. Its built-in anti-roll design prevents the tool from rolling, and the full-length blade shaft allows impact at the end of the handle. The handle and blades are manufactured in Germany of the finest-quality materials and tested to the highest standards to maintain a lifetime of use. Felo 22155, 5 piece Wooden Screwdriver Set. Set includes Slotted sizes: 7/32 x 3 1/2, 9/32 x 5, 23/54 x 6 1/2 inches and Phillips sizes: PH1 x 3 1/8 and PH2 x 3 1/2 inches. The 51719 Felo E-Smart Box is a compact set of screwdrivers for electricians nicely packaged in a plastic case. 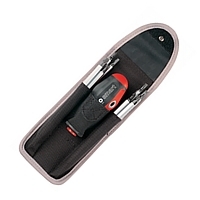 The kit includes 12 interchangeable IEC screwdriver blades with a 2-component handle. 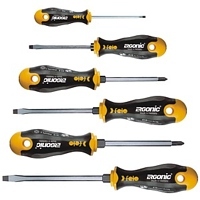 Every screwdriver individually tested to 10,000 Volts, which conforms to DIN EN 60900. The handle and blades are manufactured in Germany of the finest-quality materials and tested to the highest standards to maintain a lifetime of use. Cycle Buddy 12594 is a fold-up tool set to help motorcycle owners keep things tight on their motorcycles. The tool includes 3mm, 4mm, 5mm, 6mm, and 8mm Hex, and #2 Phillips. Bits are made from Protanium (R) high-torque steel which makes them 20% stronger with more torque and twice the wear resistance of standard grades of steel. While not designed for a major overhaul, Cycle Buddy can help keep your motorcycle fasteners tight when it comes to foot pegs, handlebars, grips, levers, brakes, air cleaners, brake light replacement and seat. The Cycle Buddy is a must-have tool to keep on hand when cruising. 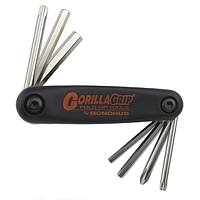 The Bondhus 12531 Hawg Buddy is a fold-up set that many Harley Davidson (R) owners could use to keep things tight on their motorcycles dating from 1972 to current. 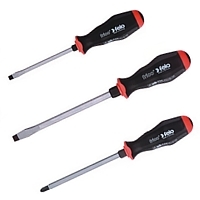 The tool includes 5/32-, 3/16-, 1/4-, and 5/16-inch Hex, T27 and T40 Star, and #2 Phillips. Bits are made from Protanium (R) high-torque steel which makes them 20% stronger with more torque and twice the wear resistance of standard grades of steel. While not designed for a major overhaul, Hawg Buddy is one tool to help keep your motorcycle fasteners tight when it comes to foot pegs, handlebars, grips, levers, brakes, air cleaners, and seat. The Hawg Buddy is a must-have tool to keep on hand when cruising.